Over a decade ago, members of Gympie & District Landcare were alarmed at the rapid and aggressive spread of cat’s claw creeper across the Gympie region of Queensland. Defying initial expectations that it was a weed of the riparian zone, it was well established along road sides, in native and plantation forests, and in upland country. Learning that biocontrol insects were being introduced following successful trials in other countries, the group hoped that this would help manage the weed where physical and chemical control were impractical. Two insects available were a tingid bug and a leaf tying moth. The group had considerable success rearing the tingid bug, but less so with the leaf tying moth, as it had a lengthy winter diapause and pupated in sand, and despite best efforts, few adults emerged from the pupation. In the past few years the group has also had success with mass rearing a jewel beetle released for cat’s claw creeper, and a beetle released to combat the madeira vine. The scale of the cat’s claw creeper problem, Amamoor Creek, QLD August 2016. Between November 2015 and December 2016, two Green Army projects supported the efforts of the Gympie & District Landcare Group. The project host – Gympie Regional Council – developed projects that had the teams working along Deep Creek, Yarra Creek and Mary River implementing a range of erosion management strategies and revegetating the riparian zones with native vegetation. 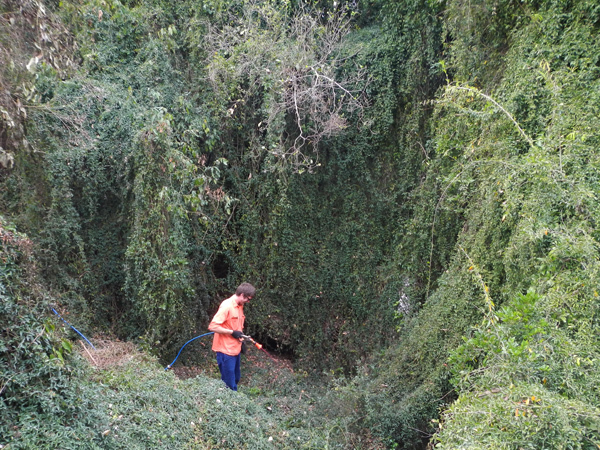 As part of the targeted outcomes, the teams have been removing and managing incursions from an array of weed species, including cat’s claw creeper. Physical and chemical control of the weeds in a small priority area has been a core benefit of their work. The teams also helped support the insect raising facility by bringing in tubers and potting them up, keeping the insect rearing facility in fresh host plants. In peak insect breeding times, this comes to 400 plants every few weeks, a tremendous support to Gympie & District Landcare volunteers. In enclosed cages at high population densities with no predators and ideal environmental conditions, the insects the group has been using all have a significant impact on cat’s claw creeper and madeira vine. The tingid bug is a sap sucker, like a vampire, that weakens the plant and causes chlorosis of the leaves. The jewel beetle is a leaf eater and leaf miner. The juveniles mine the leaves and pupate in a larval disk within the leaf, while the adults nibble on leaves. The madeira vine beetle is also a leaf eater, and at high densities its larvae can completely defoliate host plants. In open environments, the insects don’t normally kill the weeds, although in the most successful releases they have totally defoliated the targeted weeds. Both cat’s claw creeper and madeira vine have underground tubers that are not damaged by the insects, and they reshoot. The goal is to establish base populations that reduce the vigour of the vine weeds and reduce their ability to seed. Cat’s claw creeper is considered an economic weed, threatening the viability of forestry plantations in some areas. Luckily, the group’s efforts, with the help of the Green Army teams, have seen a success. For more information, contact Jenny Whyte at admin@gympielandcare.org.au.